Castleford Tigers' new signing, Daniel Smith, at the Mend-A-Hose Jungle today. The 26-year-old prop had not featured for the Giants this year and spent time on loan with Championship side Featherstone Rovers, but is now "home" after signing for the club he supported as a boy. Smith's deal sees him at the Mend-A-Hose Jungle until the end of the 2020 season. The 26-year old was born in Pontefract and played his junior rugby with Castleford Lock Lane before joining Leeds Rhinos’ academy as a youngster. He never made an appearance for the Rhinos. however, as instead Smith headed down under to play for South Sydney Rabbitohs’ Under 20s where he made 24 appearances in 2013. A move back to England followed his one year in Australia as he joined Wakefield Trinity. Over the best part of two seasons, the prop forward made 38 appearances for Trinity before signing a four-and-a-half year deal with the Giants. He has gone onto make more than 50 appearances for Huddersfield, but has found opportunities hard to come by this year. The prop forward has been given squad number 34 at the Tigers and goes straight into contention having linked up with his new teammates for training this week. He said: “It’s been a mad crazy couple of weeks. My agent gave me a call and he said this deal was on the table and I snapped his hand off really. I can’t wait to get started, it’s my hometown club so I’m looking forward to it. 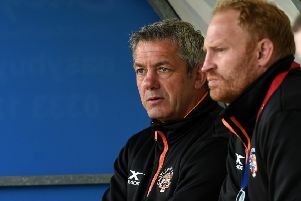 Tigers head coach Daryl Powell said: “Daniel became available recently and it was a great opportunity for us to bring him in for a couple of reasons. First, we’ve got quite a lot of players injured at the moment and second, we’ve always thought he was a player with untapped potential who would be an outstanding front rower in our organisation. Director of rugby Jon Wells added: “I’m very pleased to welcome Daniel to the club. He’s a young prop with plenty of Super League experience and we believe that he joins us as he is coming into the peak years of his career. "Daniel has been a target of ours for some time now and we are fortunate that the opportunity has arisen to bring him to the club earlier than we anticipated. For an interview with Daniel Smith and what he makes of playing for his new club see Thursday's edition of the Pontefract & Castleford Express.